MONTREAL – The fans weren’t the only ones who couldn’t wait for the puck to drop on Wednesday night. Three months after closing out a deep playoff run last spring, the Canadiens hit the ice to open up the new year against the Boston Bruins. While the result wasn’t what the team was hoping for, the tilt still marked a milestone for a few players in the Habs dressing room. “It felt good to play that first one, but unfortunately we lost the game,” described winger Aaron Palushaj, who got his first taste of life in the NHL alongside Michael Cammalleri and Tomas Plekanec. “I thought I played pretty well, moving my feet and making plays with my two linemates. It was fun. Cammy and I were talking about it after – we could’ve popped a few goals in there. 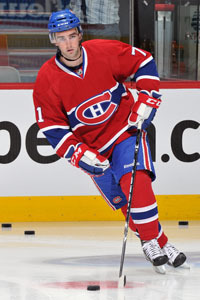 While Palushaj had fellow former Michigan Wolverine Cammalleri by his side to give him advice in his Habs debut, 2010 first round draft pick Jarred Tinordi preferred to learn by committee in his inaugural game. This time last year, 19-year-old forward Gabriel Dumont was suiting up for the Drummondville Voltigeurs in the QMJHL. After joining the Bulldogs for 11 postseason games last spring, the Ville Degelis native made an even bigger jump on Wednesday night. The other homegrown talent taking his first strides in the NHL, 2009 first round pick Louis Leblanc fired three shots on goal, threw two hits and went six-for-eight in the faceoff circle in his big league debut. While the spotlight was clearly glaring a little stronger on the Montreal native before the game, he turned to another first rounder for some helpful hints on dealing with the pressure. With the first of six preseason games now under their belts, the Habs will look to do exactly that in Game 2 against the Ottawa Senators this Friday night.